This year I thought I’d try to get a Xmas themed post out before rather than after the day. 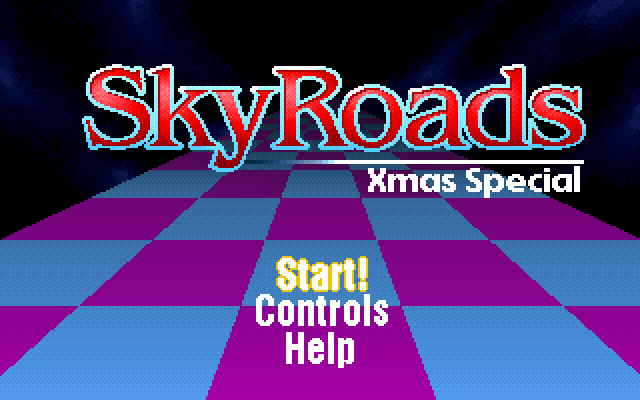 To that end, today I’m looking at the Xmas edition of Skyroads made in 1993 by Bluemoon Interactive. 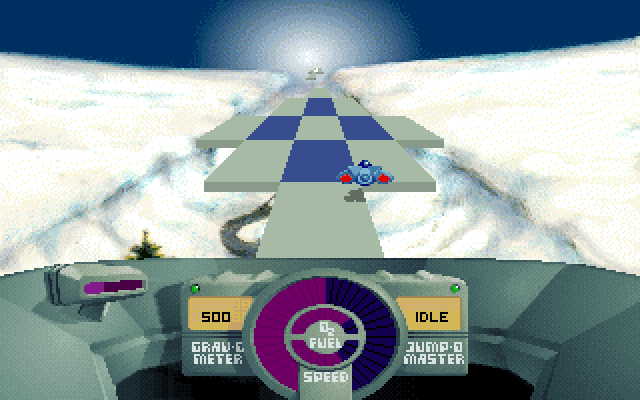 It’s essentially a driving game, where you navigate a small craft on the sky roads merely trying to get to the end. Like most other Xmas themed games it is a re-skinned shareware game, but unlike those it is shareware itself with an expanded registered version that you could buy. This will be my first time playing Skyroads of any kind. I’ve heard this one is more difficult than the original, so you should keep that in mind and perhaps play the original first. The games VGA graphics are fairly well done, most of the detail and artistic effort appearing in the backgrounds for the levels. There aren’t many sprites or animations mostly because of the game mechanic more than anything else. The level scrolls towards you and your ship, and does so quite smoothly, but it lacks any detail (such as texture mapping) it basically consists of coloured shapes. Altogether it’s fairly minimalist, but colourful and attractive. There are minimal sound effects for much the reason there are few sprites, the sound system mostly shines through its background music, which is pretty good. There is plenty of variety and it suites the atmosphere of the game quite well. Interestingly Bluemoon had quite a but of expertise in making music software for the PC. They had made a music tracker called Sound Club, which clearly had a part in making the music here. The controls aren’t as well engineered as I didn’t get along with them as well as I’d hope. The key layout is fine, only the arrow keys and the space bar are used, but it feels like there is a mild lag in the game controls, as I continually felt that the game was missing key presses. In this game that’s quite important, as precision is key, especially as the levels are fairly challenging. It affects me enough that even on levels I know and have beaten the problem arises. Mechanically the game works quite well with a few minor exceptions. Jumping and moving feel nice when the controls respond in time, and the ships behaves in a reasonable way. You can’t change direction whilst in mid-air, and some areas of the level can prevent you from changing direction. The only annoyance is the occasional time you collide with an obstacle or fall off when it feels like you shouldn’t have, luckily this isn’t a common occurrence. 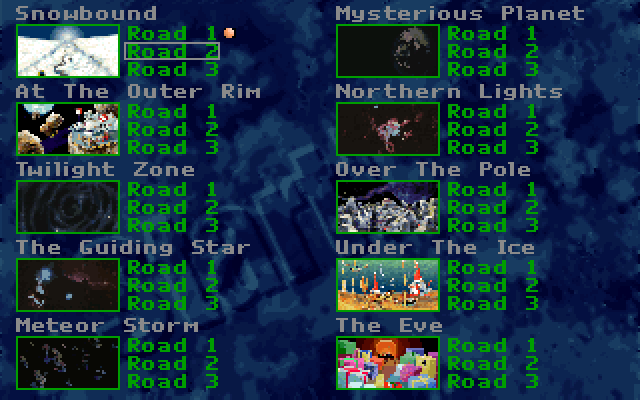 I found Xmas Skyroads a little too difficult, but I’m not really who this game was made for. It’s really for anyone who enjoyed the original and wants a more difficult challenge and on that it delivers. I could only beat a handful of the levels, but that’s to be expected. The Xmas theme is fairly light on the ground, it mostly just applies to some of the back grounds, so it’s quite playable at any time of year without feeling too out of place. Bluemoon Interactive made this and the original freeware quite some time ago, you can find it on their website.